The EU said evidence points to the use of chemical weapons by Syrian government forces against rebel-held Douma. The US, UK, France, Turkey and Pope Francis also spoke out against the alleged attack. The EU, US, UK, France, Turkey and Pope Francis spoke out on Sunday against the attack on the rebel-held area near the Syrian capital, Damascus. Medical relief organization Syrian American Medical Society (SAMS) and the civil defense service said on Sunday that 49 people had died in the attack late on Saturday in the town of Douma. "It is a matter of grave concern that chemical weapons continue to be used, especially on civilians," the EU said in a statement. "The European Union condemns in the strongest terms the use of chemical weapons and calls for an immediate response by the international community." The EU called on Russia and Iran to use their influence with Syrian President Bashar Assad to prevent further attacks. US President Donald Trump accused Russia and Iran over the alleged attacks: "Russia and Iran are responsible for backing Animal Assad. Big price to pay," he said via Twitter. Britain's Foreign Secretary Boris Johnson said on Sunday the reports were "deeply disturbing," and warned that Russia must not try to block an international investigation. Johnson claimed the Syrian forces had used poison gas in at least four attacks since 2014. The UK mission to the United Nations said on Sunday the Security Council was likely to meet on Monday afternoon over the attack, at the request of nine members: "UK, France, US, Poland, Netherlands, Sweden, Kuwait, Peru and Cote d’Ivoire have called an emergency meeting of #UNSC to discuss reports of chemical weapons attack in #Syria. Meeting expected on Monday." France's foreign minister, Jean-Yves Le Drian, called for the UN Security Council to meet quickly to examine the situation. He added that Paris would assume all its responsibilities in the fight against chemical weapons. President Emmanuel Macron said he "strongly condemned the chemical attacks" against civilians in Douma during a call US President Donald Trump on Sunday. Both leaders were said to have agreed to coordinate "a strong, joint response" to what they considered a "horrific" attack and concluded that the Syrian regime "must be held accountable for its continued human rights abuses." Turkey also condemned the attack. A statement from Turkey's foreign ministry said there was a "strong suspicion" the Assad regime was responsible for it. "We strongly condemn the attack and we have the strong suspicion it was carried out by the regime, whose record on the use of chemical weapons is known by the international community," the ministry in Ankara said. Pope Francis on Sunday joined the international censure: "Nothing, nothing can justify the use of such devices of extermination against defenseless people and populations," the pope told thousands of people gathered in St Peter's Square. Saudi Arabia called on the international community to "shoulder its responsibility toward protecting civilians in Syria," according to Turkey's Anadolu Agency which cited the Saudi SPA news agency. Russia warned the US against carrying out a "military intervention on fabricated pretexts" in Syria. The foreign ministry said that "a military intervention under far-fetched and fabricated pretexts in Syria, where there are Russian soldiers at the request of the legitimate Syrian government, is absolutely unacceptable and could have the most dire consequences." Iran's foreign ministry said the reports were an excuse for military action against Damascus, the IRNA news agency reported. Spokesman Bahram Ghasemi was quoted as saying: "Such claims and accusations by the Americans and some western countries are an indication of a new plot and excuse for military action against the Syrian government and nation." Syria denies ever using chemical weapons during the seven-year war, and says it eliminated its chemical arsenal under a 2013 agreement brokered by the US and Russia. The besieged rebel-held city of Douma in Syria is located in the east, around 10 kilometers (6 miles) outside the capital Damascus. Over the last six years, countless civilian neighborhoods have been completely or partially destroyed by Russian and Syrian-led airstrikes. Children have become used to living in these bombed-out areas and have turned the rubble into a playground. Most schools and other public institutions were moved underground because of the bombing and the airstrikes on the city. Education is crucial for this war generation as the country's future hinges on them. Most of the time, Douma is being hit by regime and Russian airstrikes. In this image, a man was checking the damage to his house while the warplanes were still flying overhead. The bread baking machines have ground to a halt due to a lack of flour and fuel to keep them running. Making bread by hand is an old tradition in Syria and some Douma residents have opened up shops to bake and sell bread. One piece of bread costs 75 Syrian Pounds (30 euro cents). Abeer* lost her right leg in a bomb explosion in front of near her home while she was with her cousin Hassan* who was killed by the same bomb. Abeer is just one of thousands of injured children. Despite her loss, she's determined to live like anyone else, playing with friends and going outside. *Names have been changed. At night Douma is plunged into darkness. There has been little to no electricity since the siege began. Locals ration the use of their generators for their shops and homes. Ironing clothes has not exactly been a priority for people in Douma but whenever possible and with the help of an old iron heated over a coal fire, mundane tasks help to regain a sense of normality. 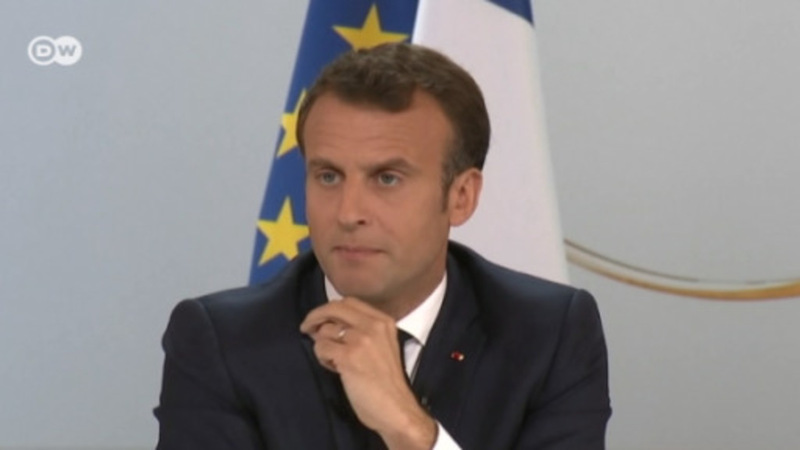 France has proof that Syria used chemical weapons, "at least chlorine," said President Emmanuel Macron. Britain has stressed the need for an international response to the attack.